Here’s a risotto recipe that will even satisfy real live Italians with its authenticity. The sun-dried tomatoes add an amazing flavor that permeates the entire dish. 1) Bring stock to a boil, then remove from heat. 2) In a separate non-stick pan, heat the oil on medium heat. Add the onion and saute for about 3-4 minutes until translucent (do not brown the onion). 3) Add the rice and stir until all of the rice is coated with oil. Heat the rice for 3 minutes or so, continuing to stir until the rice starts to become an opaque white color. 4) Add the white wine and stir constantly until it is absorbed, about 1-2 minutes. 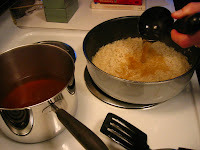 5) Then gradually add the stock into the rice, starting with one to two ladles-full, then adding another ladle of stock every couple of minutes. Stir regularly. NOTE: Do not add all the stock at once!! Instead, gradually add the stock, one ladle-full at a time. If you dump it all in at once the rice will turn out soggy. 6) When the rice absorbs the liquid, add another ladle of stock. The whole rice-cooking process will take anywhere from 18 to 25 minutes, depending on the thickness of the rice grains you are using. 7) At the 15 to 17 minute mark, you can add the sun-dried tomatoes. At about the 20 minute mark, start taste testing the rice for done-ness. It should be chewy and firm to the bite (al dente for you foodies out there), but definitely not crunchy. 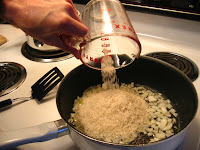 When you think the rice is done, add in the grated parmesan along with a final half ladle-full of stock and stir until the cheese is melted and well mixed into the rice. Serve immediately. Easily serves four as a main dish, serves 6-7 as a side dish. 1) Regarding the rice: If you really want to go authentic, be sure to use Arborio rice. Arborio rice is an extra thick, short-grain rice that has more starch content than regular rice. It gives the risotto a thicker, almost creamy texture. But I’ve found that regular rice works quite well too, and of course it's cheaper and easier to find in the grocery store. 2) Regarding the sun-dried tomatoes: If you are using dried sun-dried tomatoes, add them to the risotto with the first ladle-full of stock. 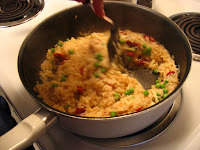 If you are using sun-dried tomatoes in oil, add them just about five minutes before the rice is done. The softer, oil-based sun-dried tomatoes will disintegrate if you add them at the beginning, and the DRIED sun-dried tomatoes will be too tough if you add them at the end. This is an important distinction. 3) I’m not sure what it is about grating your own Parmesan cheese—maybe it’s the cooking with love, maybe it’s a little extra elbow grease that adds to the flavor, who knows? 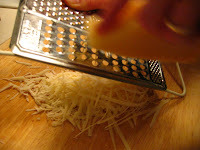 I encourage you to take the extra time and buy a block of Parmesan cheese and grate it by hand. It's just better than the pre-grated stuff. 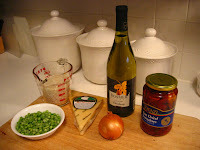 4) You can use other ingredients in addition to (or in place of) the peas. Some suggestions: mushrooms, pieces of ham or pancetta, seafood (such as shrimp, scallops, etc), garlic, or any of a number of different kinds of veggies (best to use mild-tasting and firm vegetables like snap peas, green beans, etc). Most of these ingredients should be added when you're about halfway through cooking the rice, say at the 12 minute mark. If you want some extra help on ways to experiment here, take a look at my series on How to Modify a Recipe. - It's all about technique. The CK focuses you on the PROCESS because this is most important with the dish. It's a foundational recipe. - Once you et the process down cold there are infinite variations. It's like an artist's canvas. I love risotto with peas, mint and feta - where you add the feta and mint at the very end. Or wild mushroom risotto. Or risotto with beets that is blood red and striking to serve. I even once tried to make a sweet risotto. As long as you give some thought to each ingredients and the process (as CK says in the exaple of the sun dried tomatoes) you can't miss. - You don't use the whole bottle of wine so there is a lot left for the cook to throw back while manning the stove. Trader Joe's has Arborio Rice for a fraction of the cost you might think. It's true, once the technique is mastered, combinations are endless. Wild mushroom has always been my standby, but asparagus or shrimp rissotto is also delicious. I can't wait to try the peas/mint/feta combo! Hmm, here is where I would spend a little extra to get the real Parmaggiano Regiano. Gratzi for the suggestions and for the positive vibes! I always go back and forth on the rice thing. Either it's another stop at another store or it's the rice I already have in the 20-pound bag at home. Usually I opt for the latter, even though I agree using authentic Arborio rice is even better. Mmm... that sounds good, although you would cringe at the "faux parmesan" I'd add in this house. Actually, I'd probably just leave it out. My favorite risotto recipe has sun-dried tomatoes and shiitake mushrooms. Enjoy Dazy! Thanks for your comment. The tomato-allergic among us are sobbing. What else would have a strong, lovely flavor in its stead?